Another visit to the Great Barn at Manor Farm in Ruislip. We wound the pillars with fairy lights with a double swag of lights in between. 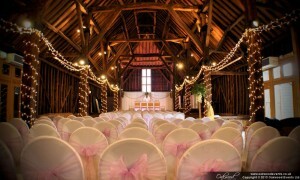 This barn is big and beautiful, and always looks great with a little added sparkle!